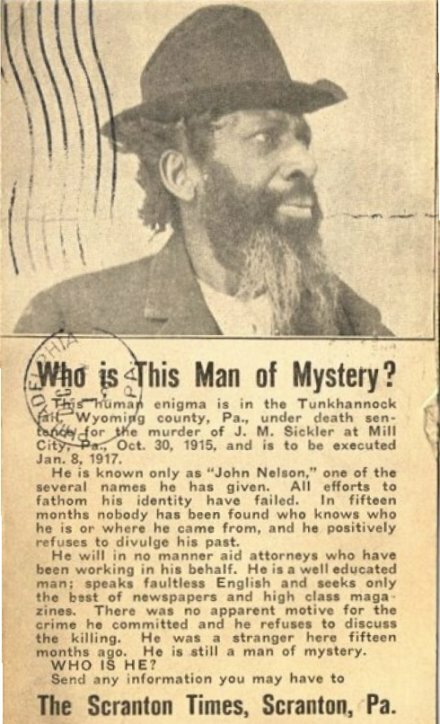 Just came across your site today (which is brilliant) & I don’t know why, but I was really struck with the mystery of this man. Maybe it’s because he looks so solemnly dignified in his photo. I know what he did wasn’t dignified – who knows, maybe he snapped, and then knowing his fate was sealed, decided to leave this world without his true identity being marred by that one moment in time. I was also taken by the fact that I’d never heard of this mystery man. 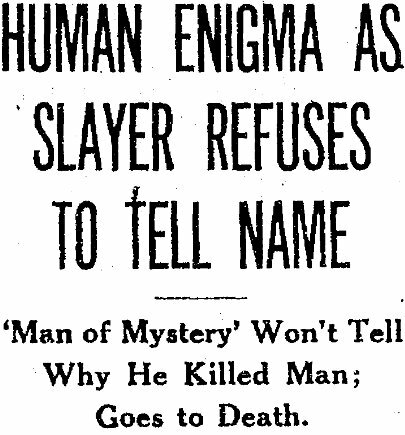 One of my favorite interwebs time-wasters is reading about unsolved mysteries, crimes, etc. And when I tried googling for more info – there was barely a thing about this “John Nelson”. I have a hunch that he might actually be from Ohio because his initial story was “Peter Jackson from Canton, Ohio”. Then, in front of the Magistrate, he said he was from “McKinleyville, Ohio”, which doesn’t exist. When the Magistrate asked the name of the town again, he said “Well, you probably don’t understand. Just mark down my residence as Canton, Ohio.” President McKinley lived in Canton & is buried there. (this was info I read from Cheryl Kashuba’s 2 part series). “MCHENRY, ALBERT DKAVES. B. Feb. 21, 18 JQ, in Tusc.ara.was- Co.
ion Col. M. July 27,1873. A. Oct. 20 r 1873. 0. at Lucknow, Jan. 11,. I think “Dkaves” as the middle name is a misspelling, but I can’t think of what it might be. More importantly, this person was born in Tuscarawas County, Ohio, which is abuts the county in which Canton, Ohio is. It’s unfortunate that the last two digits of the birth date are typos. But, I figure with the average age people graduated from college in the 19th century being 18 (a figure I admit I saw just on University of Pennsylvania’s website – got too lazy to look up more statistics), I think that would put this Albert McHenry’s date of birth around 1853. That would put him in his early 60’s when the murder occurred. Something else I think is important: he attended Mount Union College, which did admit African-American students, which would go along with how well-spoken, well-read, and well-educated John Nelson was. He arrived in India in 1873 and returned to America in 1881 – the same amount of years the Ohio witnesses said that the preacher from Ohio was a missionary in India. I don’t know what the misspelled word “Rlayfield” stands for, but I’m pretty sure “Cuyalioija” is supposed to be Cuyahoga County, Ohio. Lastly, the two Ohio witnesses said that J.E.H. Camp lived in Ohio for about 30 years. If he returned from India in 1881, the math stills works so far as his staying in Ohio for 3 decades before moving on to other states. I know J.E.H. Camp is nothing at all like the name Albert McHenry, but I don’t think it’s a stretch to imagine he had no problem using different names in different places. Sorry for the long comment. I don’t normally play armchair detective and who knows who this man really was – it just really struck me for some reason & I ended up spending a lazy afternoon trying to find anything out at all, even though there will never be definitive proof of his identity. What an intriguing connection. Thank you, Ken.